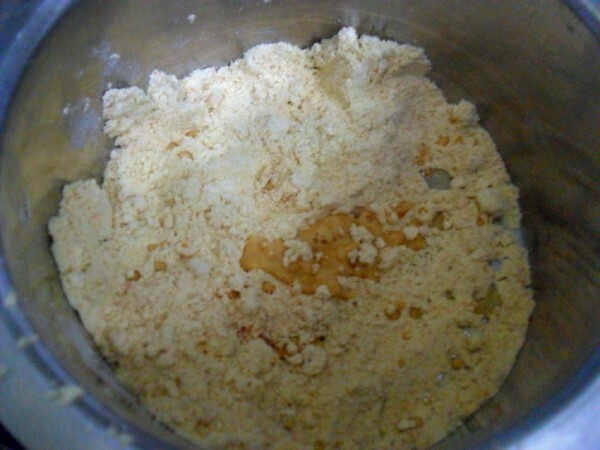 There are some dishes that you will not really think about posting on your blog. Well there is nothing wrong in posting a simple, everyday dish. However when it comes to a snack like the Onion Bhaji, I have stayed clear of it, well until now! Come to think of it, I never really thought I might one day post onion bhaji as it’s not a rocket science. Of course one might take a look at my index and conclude that there are so many that might fall under this category. Anyway as always I found myself, convincing myself that well the time has finally come when I must resort to this. When I thought of the Tea Kadai Menu, which by the way was inspired by a menu card shared in one of the FB group that I am part of. They shared the menu card from a local restaurant that has come up with this concept. I was taken in so much with it. And wanted to have that as a theme. However they simply had about 4 – 5 dishes and to make the theme less complicated and more complicated in terms of other ways, I decided on 5 sets, from which we have to make select 3 dishes. Infact I included somosas and bajjis just to make it a bit easy. On the other hand, I also thought of featuring either coffee/ tea mandatory in the picture. That’s called digging my own grave! Anyway with the conditions and the dishes that I could actually make it in the shortest span of time was the Onion Bajji. Konda, infact Athamma too, were both taken aback that I have not featured onion bhajji. I told Konda that Onion bajji is not actually a recipe to share! To make it look more like the bhajjis you would get from a tea kadai, I served it on the newspaper. The tea glass was supposed to be that original tea glasswala, unfortunately I couldn’t lay my hands on those. And my makeshift tea stands on salman khan’s face. Now he will never pose a competition to my onion bajjis, I simply didn’t want him featured. And remembering the onion bajjis, I remembered the Potato Bajjis we stop to eat on the national highway between Tada and Chennai. The Andhra Tourism Hotel, serves a select snack during the evening time. And Potato Bajji with Red chili chutney is always on their menu. The potato bajjis are so crispy and chutney so spicy, that the combo is a sure die for. We were remembering the many occasions when we stopped just for those bajjis and Hubby dear said I didn’t meet their match. Well I would be taking up the challenge pretty soon I replied. 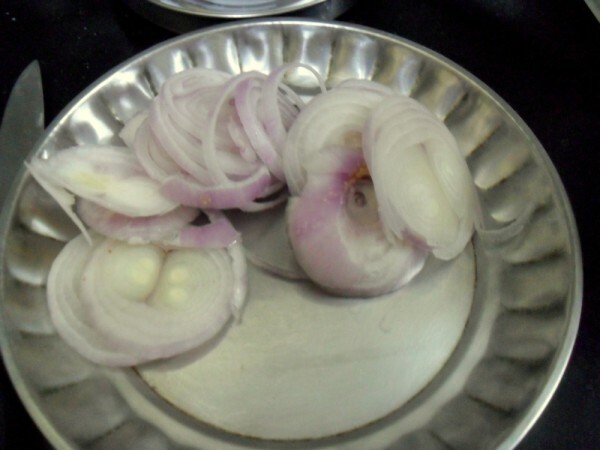 It’s really pretty hard to arrive at the measurement for onion bajjis as this is always done as you go. Only difference here being I used cold water to get the effect of Tempura. 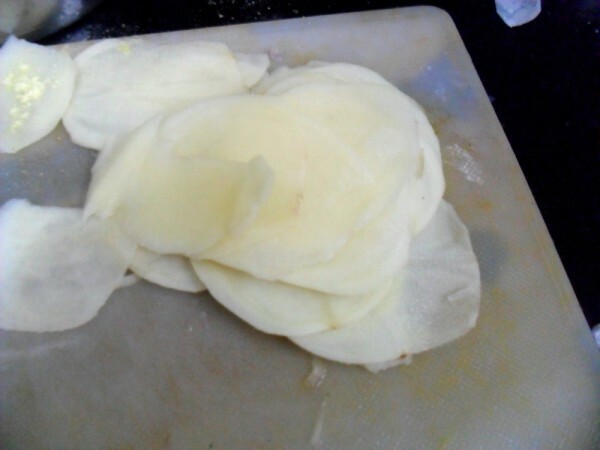 And the onions and potatoes are sliced really very thin. At least potato was. 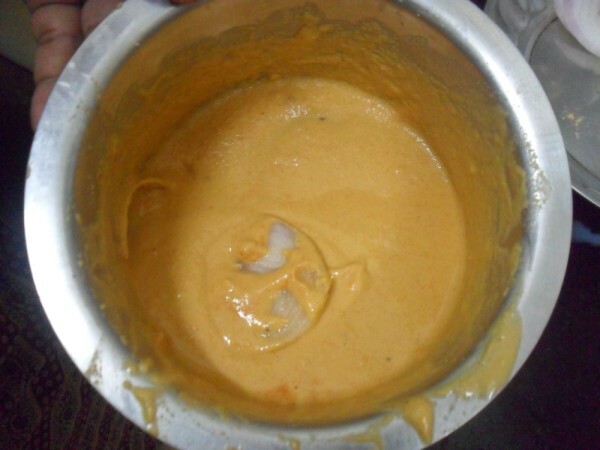 Have the oil getting hot, dip the slices into the batter and gently drop into the hot oil. Cook on medium flame to make sure the bajjis are cooked well. The climate in madras has been straight out of dream, and I wouldn’t mind having these on frequently basis, however fattening it is. Konda is grown enough to enjoy the bajjis, the boys are yet to start. I know I will have more demands when they start liking this snack! 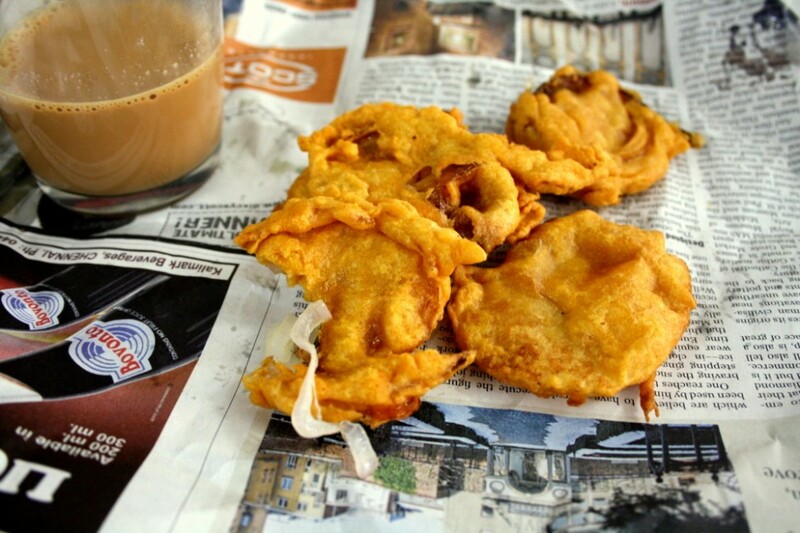 Oh these are super hit bhajias and everyone has a different way to make them, so it is perfectly fine to blog them..might be simple, but surely a recipe which turns the simple onion into a mouthwatering snack. 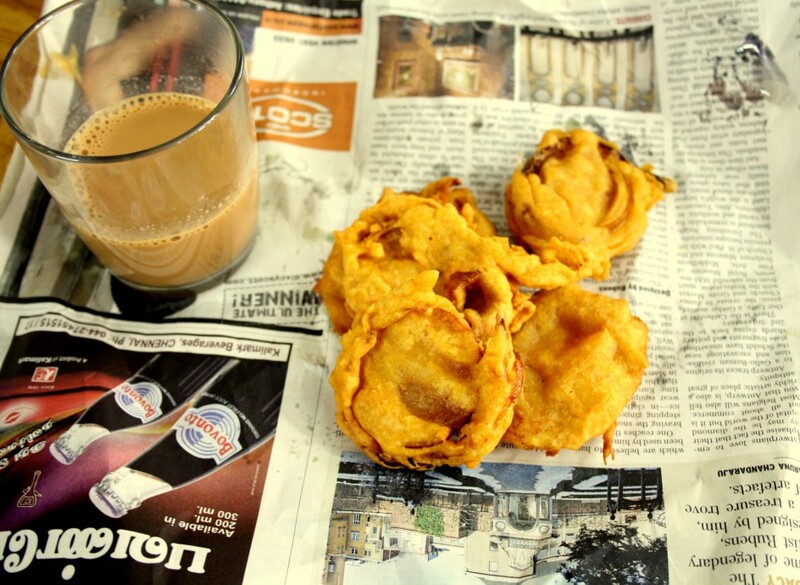 It's raining here in Delhi and a perfect time to grab those bajjis with hot chai…. Lipsmacking bajjis and they look just like the tea kadai ones.. really nice picture and well written prelude. enjoyed reading it. would have liked the newspaper rotated, so that we can read it. I always read the little truncated portions on bajji/bun/egg wrapped papers..
Onion bajjis are our all time favourite snacks, drooling here. Such yummy bajjis! i always love the tea kadai vadais and bajji. they have a flavor that speaks for themselves. Very well presented valli! oh the favorite on the tea kadai menu!!! delicious and very tempting!! 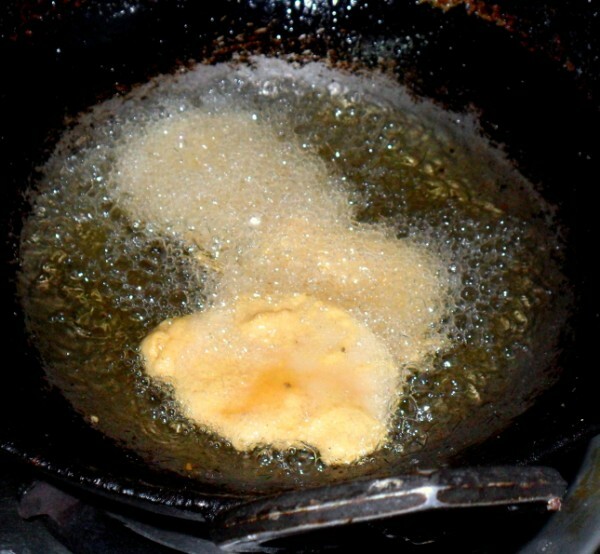 This is one of my fav bajji from tea stall. Looks so tempting…. Nothing can stop me from munching those bajjis in the weather we have here right now! Bajjis look crispy and yummy!! One of my favorite snack. They taste better for me when we get it from road side shops.